Robersonville, NC Bojangles'® Tands, INC. Store #46 - Bojangles'® / Tands, Inc. 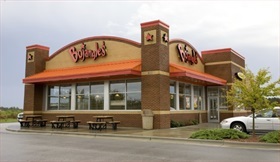 The Robersonville, NC Bojangles’® is located just off of Hwy 64/13, perfect for travelers to make a pit stop and fill up. Race enthusiasts love to grab some Bojangles’® on their way to and from a race at East Carolina Motor Speedway. Our Big Bo Box® is the perfect choice to feed the group on the go. Robersonville locals love the southern-style food and affordable prices at Bojangles’®! The Bojangles’® menu includes a range of comfort food favorites like spicy Cajun chicken, warm and fresh buttermilk biscuits, sides like slaw and Dirty Rice®, and our Legendary Iced Tea®. If you’re hungry, it’s Bo Time! We open early for breakfast and have filling and flavorful choices for lunch and dinner, too.